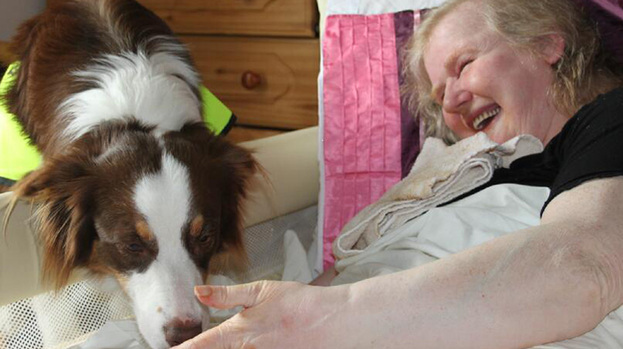 Pets As Therapy is a national UK charity founded in 1983. It provides therapeutic visits to hospitals, hospices, nursing and care homes, special needs schools and a variety of other venues by volunteers with their own friendly, temperament tested, vaccinated dogs & cats. Since its establishment 28,000+ PAT dogs have been registered into the Pets As Therapy scheme. Every year some of these retire and new dogs, having first been examined and passed on health, temperament, suitability and stability grounds, join Pets As Therapy. Currently 4,500 active PAT visiting dogs and 108 PAT cats work in the UK. Every week these calm friendly dogs & cats give more than 130,000 people, both young and old, the pleasure and chance to cuddle and talk to them. The bedsides that are visited each year number a staggering half million. Sick patients often feel isolated and even the most withdrawn seem to open up and let the barriers down when their regular Pets As Therapy visiting dog is around. These dogs bring everyday life closer and with it all the happy associations for them of home comforts. The constant companionship of an undemanding animal, that gives unconditional love, is often one of the most missed aspects of their lives. Pets As Therapy was formed to help make this loss more bearable and speed recovery. Research continues to validate the very real value of this daily work undertaken in the community by voluntary Pets As Therapy visitors and their dogs that work amongst those of us most in need of a little extra boost in addition to medical skills and nursing care. Pets as Therapy are in the process of setting in place research to further validate the very real health benefits these animals bring daily into the lives of those people who are ill or disabled. All Pets As Therapy dogs and cats are required to pass an assessment to check their temperament by Pets As Therapy accredited assessors or qualified vets be fully vaccinated, wormed and protected against fleas. Records are required by the charity and each volunteer is bound to send copies when boosters have been given. Each Pets As Therapy dog has an identifying tag on its collar and many of them wear a distinctive yellow coat. The owner has a photo ID badge which is worn for security at all times when visiting. Pets As Therapy have introduced a photo ID tag for its Pets As Therapy Dogs & Cats as well. As the largest charity of its type in Europe, Pets As Therapy recognises that security needs are paramount and that busy authorities and on duty staff alike, need the reassurance of a therapeutic supportive service which is problem free. Any dog or cat can become a PAT dog or a PAT cat, as long as it has been with its owner for at least 6 months, is over 9 months of age and can pass the assessment. All PAT dogs and cats wear a special ID disc on their collars. Their owners also wear a special ID badge whilst on visits. 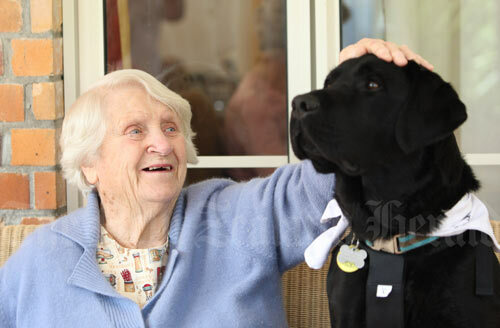 Pets As Therapy volunteers generously give their time. The amount of time varies, but regular visits are appreciated. Find out here about the application process and what is expected of you as a volunteer by downloading the fact sheets before making a full application.